The Ontario Employment Education & Research Centre (OEERC), in partnership with the Workers’ Action Centre, will host its 6th annual fundraiser on Saturday, November 4. With the money raised through the Workers’ Bowl, WAC is able to provide workers’ rights workshops in different languages across the Greater Toronto Area, as well as leadership education for workers in precarious employment. Over the next weeks we’ll be sharing the stories of WAC members who have spoken up to enforce their rights as workers, who continue to do outreach and education with their communities, and who support workers in dealing with experiences of injustice. Please join us in celebrating them, their courage and hard work. 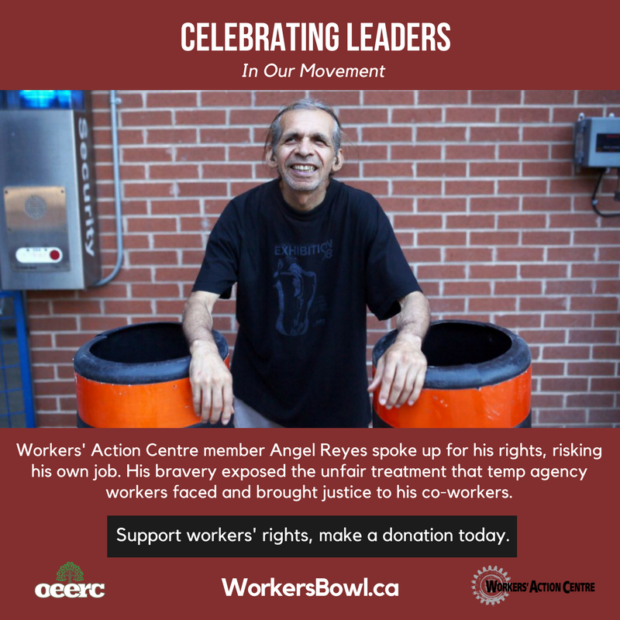 Angel Reyes has been a member of the Workers’ Action Centre since 2008. In 2015, Angel shared his story with the Toronto Star about being hired as a temp agency worker at the same recycling plant for 5 consecutive years, yet still earning less than his directly hired co-workers on permanent contracts who performed the same job. He voiced one wish: to be hired on directly. Not long after, he lost his temp agency job. Just recently, on September 25, a Toronto Star article reported on the wide-spread gains resulting from Angel’s bravery. His decision to speak out led to a broader investigation into Canada Fibers. As a result, the company must now pay $1.33 million in fines and back pay to the other temp workers who were in Angel’s situation. This goes to show that in most workplaces, when one worker files a complaint, it is very likely that other workers are experiencing the same violations. Angel Reyes showed us what can be accomplished by speaking out, breaking the silence around poor working conditions. He showed us how we can challenge unfairness. WAC’s leadership development and educational programs support workers like Angel to learn about their rights at work and address violations even in very precarious work situations. We are proud of him and all of our members who take a stand for themselves and for all workers. We invite you to take part in making these victories happen. Please consider making a donation today. Every dollar will help fuel our educational programs that support thousands of workers each year. (Tax receipts are available for donations of $10.00 or more.) We also invite you to join us in celebrating Angel. Please share his story with your network.